It's a Friday, so it must be time for the Crazy Crafters Team Project Highlights! Do go over and have a look at all the entries - there are a lot talented Crazy Crafters so it's worth the look! Just click on the image to the left to link to the highlights. If you visit between 6.30pm on Friday 15 April and 6pm on Friday 21 April, you'll be able to vote for your favourite projects. Botanical Builder thinlits create such a quick and easy wow factor! Lack of time forced me to keep it simple this week but I'm quite pleased with the result. I do love the Botanical Builder thinlits - they come to my rescue so much! Perfect for creating a bit of a wow accent with no stamping involved! I added a Rhinestone Jewel to the centre of one of the In-Colour Blossom Accents and then placed it into the centre of the large flower. I used the Banner Triple Punch to trim the ends of the strips - such a quick and easy way to make banners with as many layers as you like! 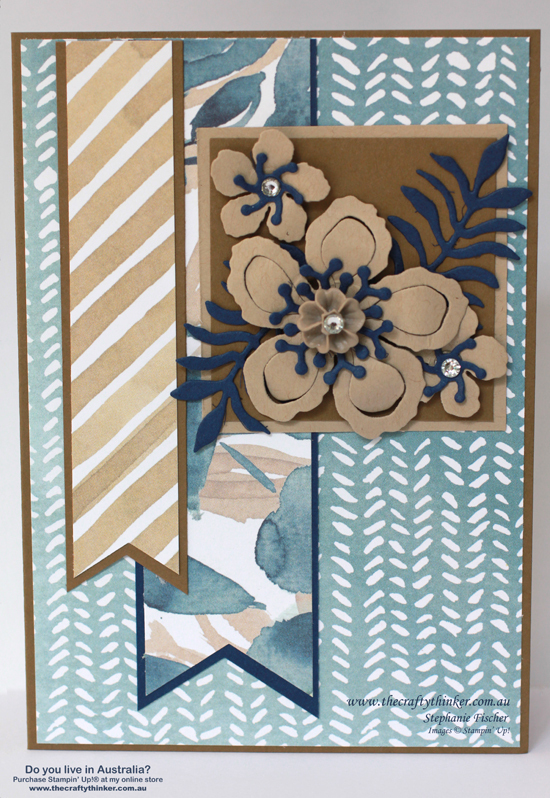 The card is made with English Garden Designer Series Paper and the cardstock colours are: Soft Suede, Night of Navy and Crumb Cake. Thanks for visiting - remember to look at the other projects in the highlight. To make a purchase in my online store, click on one of the product images below.